John Lennon, Paul McCartney, Elvis Costello, Burt Bacharach and John Barry are the 5 primary pop music influences. Lyrics are 50% of a pop song; they should either make a philosophical point or tell a story. Tambourines and shakers must be used. The following words will never be used in a rhyme scheme: heart and apart; young and fun; dead and bed. Verse, chorus, verse, chorus, bridge, verse, chorus. In music videos, no one will be seen playing a musical instrument. No good pop song can come from jamming. 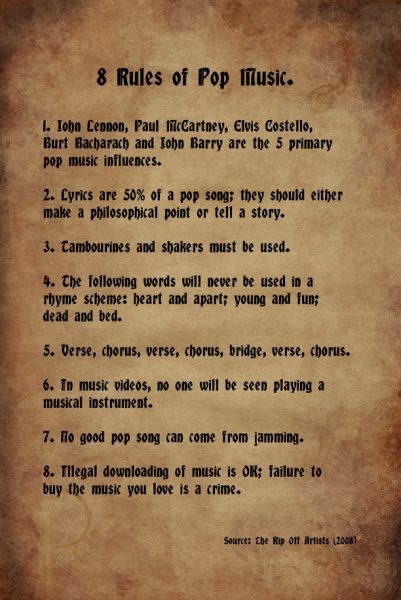 Illegal downloading of music is OK; failure to buy the music you love is a crime. There are a few things I’d tweak: I’d replace John Barry with Brian Wilson; music should be way more than 50% of a pop song; and I prefer hand claps over shakers. Write songs that you can hum. Use variety in creating melodies, using large intervals between notes sometimes; if making a simpler melody, make the chord progressions more varied. Use harmonies in a way that adds richness and texture to the overall tune. I-IV-V works well, but It can get dull. Insert and substitute other chords for variety and surprise. Create tension in songs so that the melody and chords yearn to get back to the root. Songwriting is a craft. It’s hard. Sure, some melodies and lyrics may come easily – remember, Paul McCartney dreamed the music to “Yesterday” – but it doesn’t mean that a “Hey Jude” can arise from just playing and waiting for the music gods to inspire you. Like writing, it may take several rewrites, edits and embellishments. You may hunt for days, even weeks for the right chord to unearth itself and make itself known to you. It may take even longer to find the right harmonies, trying to strike the balance between too little and too much. And then, after you get the song right, you have to think about instrumentation and recording techniques. Don’t think art is easy. Billy Joel and Elton John: Cool or Uncool? I’m for replacing John Barry with Brian Wilson because I have no idea who John Barry is.